The important thing to keep in mind in planning your workshop is to have ample space around your carving bench. I find that, for my purposes, a clear space of 30 inches all the way around is ample. This enables me to manipulate any carving about the bench top with no fear that I will hit the walls of the shop or the adjacent benches. Amazing New Home Smart-Saw Does The Work of 10 Professional Woodworkers... Click Here! For artificial light I have found that four 150-watt lamps are ample. These are spaced, roughly, above the four corners of the carving bench. For daylight, if it is at all possible, have ample windows on the north side of the shop. This light is diffused and casts thin shadows as you work on the bench. Direct sunlight should be avoided. The carving bench should be fastened firmly to the shop floor. 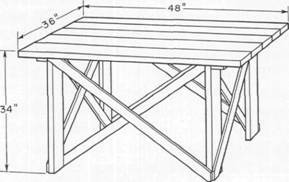 I show a drawing of my bench in Figure below. Note that the bench is braced both ways on each side. This is for stiffening purposes. The size has been ample even for extremely large carvings. The legs are toe-nailed to the floor with eight-penny nails. The most satisfactory bench top I have found is made up of hemlock plank. These plank are set on the frame with a 3-inch overlap at the ends and 2-inch overlap on the sides. I fasten them to the frame with wood screws set in counter-bored and drilled holes, the counter-bored holes being filled with plugs. In this case the plugs are not glued in place. I like hemlock tops for this reason: the stock holds brads and is soft enough so that if you happen to run a carving tool off the carving and onto the bench top it will shear part of the wood but not harm the tool edge. I don't bother to do more than smooth the bench top off with the jack plane once in a while. I do not glue the top up either. I have used this carving bench with complete satisfaction for seven years and it is still in good condition. A cast steel woodworker's screw vise should be fastened to one side of the carving bench. In my case, I face the steel jaws with wooden faces, using either yellow birch or maple for this purpose. My vise jaw faces are 21 inches long, 7/8 inches thick, and about 6 inches wide. I replace them whenever the inside faces get abused, usually every two years. 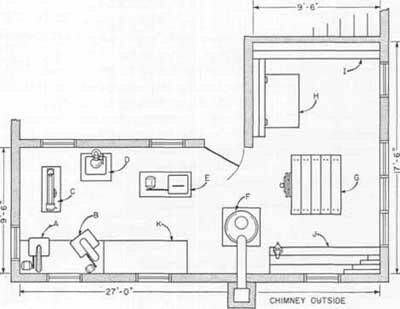 Figure 4-1 PLAN OF WORK SHOP-27 feet long, 9½ feet wide, plus elevation: 9½ feet X 8 feet. 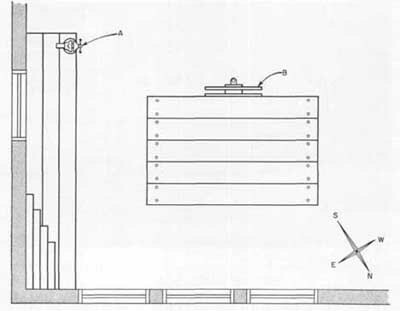 Figure 4-2A PLAN OF SHOP, SHOWING CARVING BENCH, SIDE BENCH, TOOL RACK, METALWORKING VISE (A), WOODWORKING VISE (B), WINDOWS, ETC. Image 18 The woodworker's vise on the carving bench. 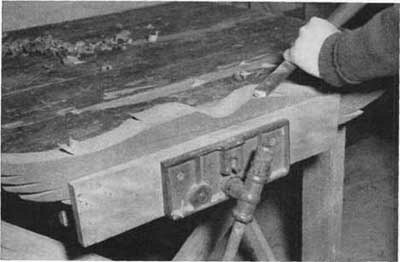 Note long, wooden faces on this vise. Yellow birch can be used for faces. If the top of your bench does get abused, plane it off to keep the splinters under control. If you use brads to hold small work in place with edgings, when the latter are removed, pull out the brads with the claw hammer. I find that a side bench is a most handy adjunct. Mine is 2 feet wide and 8 feet long. I keep my carving tool chest on it as well as a miscellany of other things-pencil holders, work gloves, torn sandpaper, paper handkerchiefs, bottles of water, oil and turpentine, sometimes reference data, and generally what-have-you. It's a handy place for visitors to lean against and sometimes sit upon, too. The tool rack can be almost any kind of a drawered chest or just pieces of 6-inch pine boards. It doesn't matter. The important thing is to have it handy. For years I had a carving tool rack made up of two pieces of boards with narrow separators set between the tools. Then I found an old "thread case"-a chest with six drawers -and I use that at the present time. Don't roll tools up in cloth and then try to find them. This may result in the edges coming in contact and that means more sharpening. It is important to have a space available for finishing. If you have to use your carving bench top for this purpose, schedule your work so that you can tie up your shop while the finish you put on the carving can set without dust landing on it and so that you don't have to use the carpenter's tools or your carving tools in the shop until the finish is hard. I use the shed of the house for my drafting and finishing room, but I'll probably have to go back to the barn if my better half starts up her antique shop again. If so, I shall use the loft of the barn for these purposes, sealing it off before I do. Your drawing table can be extemporized from your carving bench, if necessary, by using a piece of 5/8 inch plywood as a drafting table top. If you do, have it clipped absolutely square. I use a piece 30 x 72 inches when I have large sections or carvings to design. If not, I use my old drafting table. Use cellophane tape to hold the corners of the drawing paper down if you use plywood. Be sure the plywood top is smooth. The best way to assure this is to dampen the plywood with a moist cloth which raises the grain slightly, then sand it smooth with No. 1/2 paper, then varnish it, then sand it down again. You don't need an elaborate set of drafting tools. A tee square and a sharp pencil are good starters. Everyone has an idea as to what a good set of drawing equipment is. Mine are pretty well abused after thirty years of use; some of them are missing; my grandsons use them for their "things." I use them as little as possible. For pencils, I buy a dozen at a time. My wife uses half a dozen of them for her crossword puzzles. The rest I keep sharp and handy to the drafting board. I use three grades: Number Ones for outline drawings, Number Threes for heavy outlines after the sketch is done, and a layout pencil for final shading and definition. There is a saying in this business, "If you can draw it, you can carve it; if you can't, you can't."